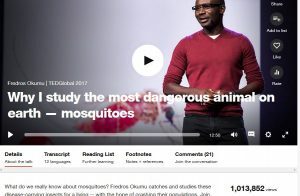 (Dar es Salaam) A talk on the biology of mosquitoes by IHI seasoned researcher Fredros Okumu on TED.com –- an international platform holding conferences and posting talks online –- has registered over one million views. A spot check on the platform around 16hrs EAT on August 3 2018 revealed that the talk, bearing the title, “what do we really know about mosquitoes?” had a total of 1,013,852 views. It was posted in August last year, which is exactly a year ago. Dr. Okumu, known by his peers in IHI corridors as Fred, studies human-mosquito interactions, hoping to better understand how to keep people from getting malaria. He gave the talk in Arusha Tanzania last year. You may watch the talk here: Why I study the most dangerous animal on earth – mosquito.